Bind the Up, Down, Left or Right keys, turn OFF Num Lock. 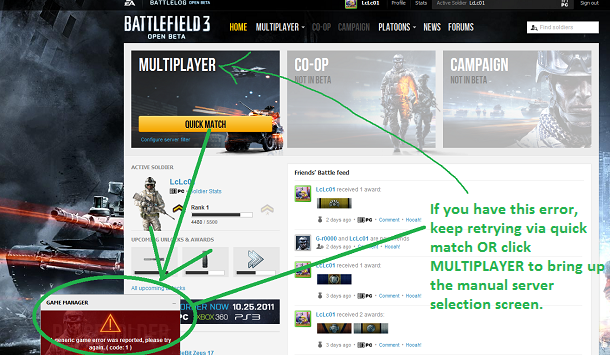 This one is simple so I will get straight to the point so you don’t have to trawl through the EA Battlefield 3 forums. 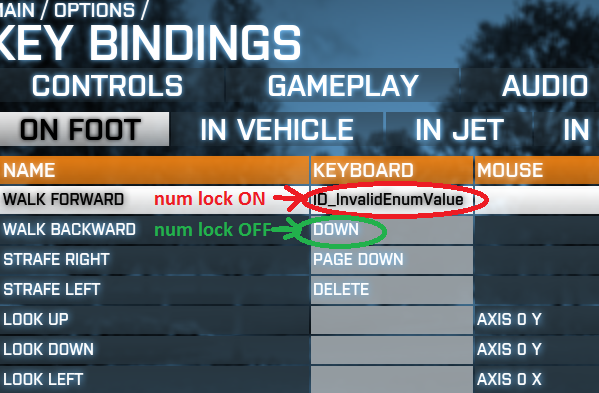 If you want to bind the ARROW keys in BF3 you need to have Num Lock OFF. If you leave num lock ON you will get the error message ID_InvalidEnumValue. I hope this helps you get into the game with keys other than WASD. Not everyone plays WASD as we found in Mass Effect 2, some of us prefer the arrow keys. As for the rest of the the Battlefied 3 beta, I’m pretty pissed off that the options menu can ONLY be accessed whilst in game. You need to find somewhere to hide, which is difficult and ends up with abuse from other players calling you a camper when they find and shoot you down. Why on earth would you only be allowed to access the options menu whilst in game, it is the worst time to be binding your keys, changing your graphic settings and adjusting your mouse sensitivity. Who tests this stuff? Who thought that was a good idea? It creates a server full of newbs doing nothing but testing binds and graphics settings, and free kills for other newbs. I know it is a beta, but how did this get past alpha with such a basic flaw? Anyway moving on, the web based interface is ok as I got used to this with Quake Live, so not much to say on that. Generally it works although a few times I have had the A generic game error was reported, please try again. ( code: 1) message but this just seems to be random, keep trying and eventually you can get on a server. Otherwise try clicking the MULTIPLAYER text rather than the QUICK MATCH button, this will bring up a manual server browser and has prooved to throw up less errors than the match making of ‘QUICK MATCH’. This is really where you want to be to select a game anyway, the server browser. After all match making and quick match are for console gamers right? 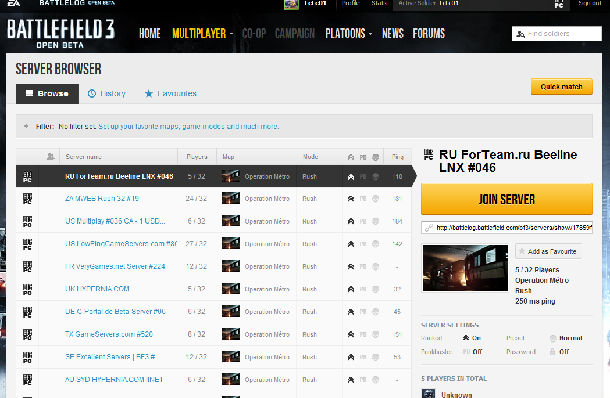 Here you can select a server of your choice, see the stats before you jump in. Well hidden EA! Oh look, a server browser, well hidden EA! This entry was posted on September 30, 2011, 1:00 pm and is filed under PC. You can follow any responses to this entry through RSS 2.0. You can leave a response, or trackback from your own site. EA is bad. Dice is bad. 5 BFs later they still don’t know how to build a frigging bind system. ORLY u can’t bind the arrow keys without changing num-lock? ORLY i already know u can’t bind the mousewheel either. bad software by bad people.